Cave Dad, who likes to be “brave”. However both parents (who seem quite self-involved!) 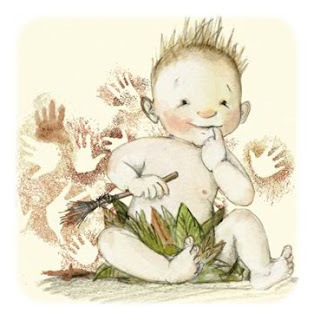 do not seem to appreciate when he decides to scribble all over the walls so Cave Baby is banished to his cot, with the threat of a mammoth who gets naughty children and throws them to the big brown bear hanging over his head. 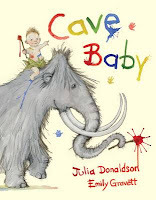 So when a hairy mammoth does turn up in the middle of the night and abducts the little cherub, Cave Baby fears the worst. They go on a moonlit stroll where they meet a sabre-toothed tiger, a leaping hare, a laughing hyena but no sign of a bear (well unless you can spot him in the illustrations – a great game to play with the young audience!). 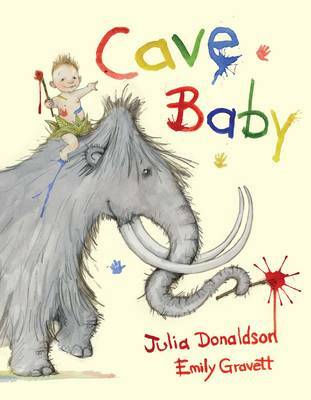 Eventually they arrive at the mammoth’s own cave where it soon becomes clear that this hairy family is only after his artistic skills … and Cave Baby happily obliges! 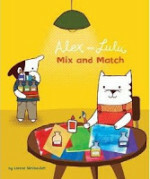 Two of the “biggies” of the picture book world have come together this August to create one magical picture book. I had been looking forward to this for so long, with a little dread that it might disappointing because I love Emily Gravett’s work so much and was worried that with her first collaboration she might lose a bit of her individuality and originality. But oh no, this is so much better than I could have imagined. Both Donaldson and Gravett are in great form, delivering what they do best: the rhyming text is spot-on as usual, lively, happy and rolls off the tongue. The illustrations are equally lively with an array of wonderful colours and an aura which is hard to describe but is easily recognisable as Gravett’s trademark. Both work incredibly well together and create a beautiful ode to creativity and the magic and power of dreams. 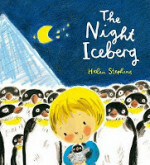 A great bedtime read, with the cutest baby I have seen in a long time! Wow, this is sure to be a hit. I love the colours – so vibrant. Oh my, that is a very cute little baby! We’ve been reading Shoe Baby with Milo a lot recently and the baby in that is just so squishable. 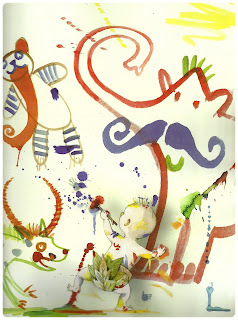 Amazing how a good children’s illustrator can do that! 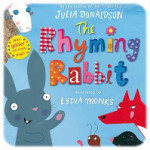 Julia Donaldson tells a great story! 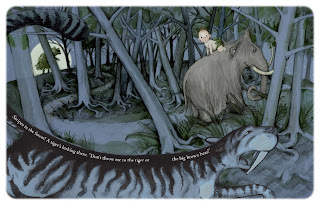 Add to it the incredible artwork that Emily Gravett consistently produces and it’s a smash hit. I have shared it in many classrooms and it is universally loved!